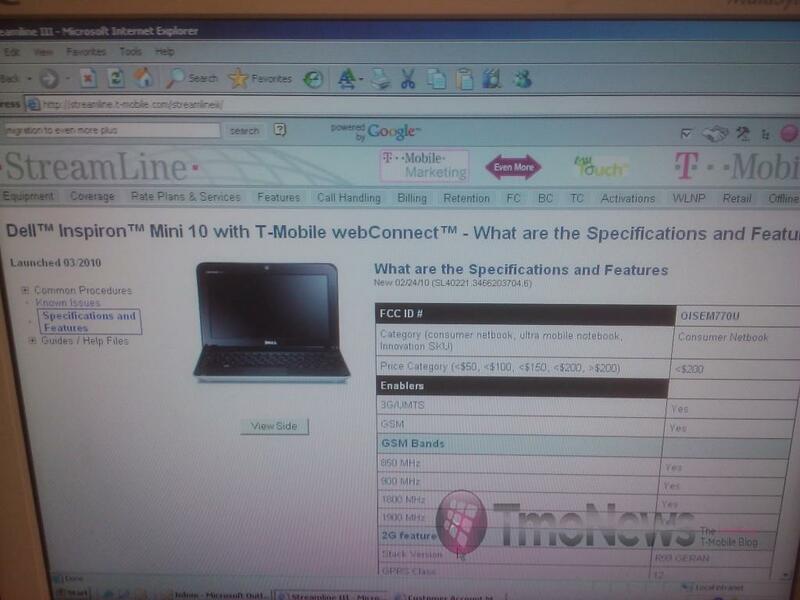 If you hadn’t yet started to believe that T-Mobile would finally unveil its first 3G equipped netbook, this image might sway you into becoming a believer. Unfortunately, the details we want most, exact pricing and release date (still placing our money on March 24th), are nowhere to be found but I think this puts to rest any disbelief that T-Mobile was about to roll out its first Netbook. The only solid piece of information here is the price category, “less than $200″. We’ll have to wait and see how pricing actually plays out as AT&T and Verizon currently sell the bulk of their Netbook line for $199 and below. Put the price point any higher and T-Mobile better offer up one hell of a rate plan for this as the smaller 3G footprint will require some incentive to get customers on board. I hope that we’ll get all the answers to pricing questions and release date soon, very soon. Cool. Wonder what data plan, they will try to force on the customers. It would be good if the current data plans like the BB data plans, would work on the Netbook. $300 netbook, tethered to your smart phone? or this thing for “greater than $200.” plus a mandatory monthly data plan separate from all your other plans? Caught and fixed that just as you left your comment, sorry its late! Hopefully the data plan is appropriately priced, I don’t see them selling too many at the same price as Verizon/AT&T per month. Anyone know what OS it’ll be running? PRice shows <$200 in the picture meaning Greater than $200! WTF?! this thing is gonna be overpriced isnt it? DUHHHH…go back to basic 3rd Grade math MORON! <$200 means UNDER $200 FTW! For those who skipped on math class… means “greater than”. It is LESS THAN 200! Is that with external/usb webconnect dongle or internal radio/capability? Ugh why is everyone already bitching about having to do a data plan? What the hell else you gonna do with it? Def. cool though will probably get one if the price isn’t too much. Under the Even More plan (with a 2 year contract) it is $199. Under Even More Plus it is $449. I work for T-Mobile and we had a training on it today. If you want one without a data plan, just go to Dell’s website and buy one for around $300. I can’t even imagine the type of people coming out of American public schools these days. No less than 4 people including the T-Mobile News “journalist” originally reported that it was “more than $200”. Do you now know a LESS THAN sign when you see it? On top of that, even if you were so intellectually deficient that you thought a “less than” sign was “greater than”, you would have only had to look where it lists the tiers in increasing order all the way up from less than $200 to greater than $200. We actually using less than/greater than for some general observations in my beginning geology lab in college. Moron sitting next to me had no idea which direction each one was – the professor actually decided to go back to the whiteboard and “remind” everyone what each one meant. Wow. I am starting to think they do not teach something this simple in school anymore. I graduated high school over 10 yrs ago – I still remember – so it’s definitely a different breed out there. Mistakes happen, it was late and I quickly corrected it. Sorry if I have let down the American public school system. OH no!! a typo! hang him! Jason Bonham is a shyte drummer who lives in the shadow of his father anyway. Me personally, I didn’t bother to look at that screen shot and was relying on T-mo News reporting skills which originally said ‘greater than’ and which we all know was a mistake so a-holes with lame user names need to STFU already. F’n chumps. Well hey Jennifer, how about some speeds and feeds? Wireless n? Bluetooth? HSPA+? Broadcomm HD chip? 1368×768 HD screen? 2 Gigs RAM? TV Tuner? 250 Gig Hard Drive? And yeah, $199 with a contract. Yeah, the Nokia was built very nicely, but it was a weak performer in the first iteration. Hopefully Nokia will beef it up in future iterations and then T-Mo picks it up.